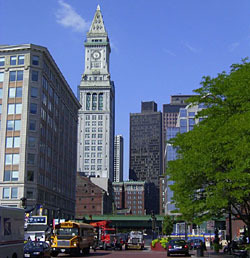 Consisting of 70 buildings and sites on 15.9 acres in downtown Boston, the Custom House District is a collection of 19th-century mercantile buildings in addition to many well-preserved skyscrapers dating from the first half of the 20th century. The Custom House District is a diverse architectural environment in form, scale, materials and styles. Nineteenth-century buildings rarely exceeded six stories in height. However, by 1900, 11-story buildings were increasingly common. Boston's pre-1928 building code, which limited commercial buildings to 125 feet high or approximately 11 stories, dictated the scale of the district. Developers compensated for this restrictive zoning by using innovative massing techniques and by expanding the floor plate. The district's most prominent buildings encompass entire city blocks. The U.S. Custom House, the building for which the district is named, is located in McKinley Square. Designed by Ammi B. Young in the Greek Revival-style and constructed from 1834 to 1847, the U.S. Custom House was expanded with a 25-story tower addition in 1915 to accommodate additional office space for revenue agents. The tower addition was designed by the prominent Boston architectural firm of Peabody and Stearns, who also completed plans for two other buildings within the district. As a Federally-owned property, the customhouse was exempt from the local building codes of the time and was thus the most prominent feature of the Boston skyline for more than 30 years. 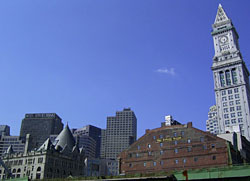 Until the introduction of the Federal income tax, the United States government relied on the duties and taxes collected by the Customs Service at Boston's wharfs. To the southeast of the U.S. Custom House is the head of Central Wharf, which once possessed the longest continuous block of warehouses in the country and housed many prominent merchants. It was constructed circa 1816 and exemplifies the engineering of Boston's early 19th-century maritime buildings. Atop it were built 54 brick stores; today only 8 of these remain. By the turn of the century, the ports of New York and Philadelphia had eclipsed Boston in terms of commerce; however, Boston remained a bustling seaport transporting both goods and people. Constructed in 1901, Chase and Sanborn's immense six-story brick warehouse at 141-149 Broad Street was the last warehouse built in the Custom House District. The company was founded in 1864 by Caleb Chase and James Sanborn. The men were tea and coffee dealers, who innovated the way coffee was distributed, shifting from bulk to packaged goods. In addition, two major transatlantic shipping lines sited their offices on State Street during the first decade of the 20th century—the Compagnie Generale Transatlantique was headquartered in the Postal Telegraph Buillding at 100-110 State Street and the Cunard Line, a pioneering British-owned transatlantic steamship company, constructed its local headquarters at 122-130 State Street. The Custom House District is roughly bounded by the J.F.K. Expwy., Kirby, S. Market, High and Batterymarch sts. in downtown Boston. Some buildings within the district are commercial and open during normal business hours. The U.S. Custom House is now a hotel operated by Marriott; visit the Marriott for further information.